Take the News On 6 Weather Team with you wherever you go with the News On 6 Weather app for your iPhone or Android, now with Weather Radio features. Get the latest forecasts, radars, warnings and watches, videos and blogs from The Oklahoma Weather Experts Travis Meyer and the Warn Team. Stay informed while on the go with the News On 6 mobile website. Instant access to live animated radar, current conditions, as well as hourly and weekly forecasts, so you can stay weather aware, wherever you are. Don't let Oklahoma's severe weather slow you down or take you by surprise! NewsOn6.com on your desktop or mobile device lets you live stream important coverage and updates from Travis Meyer and the WARN team. When severe weather strikes it is always important to have as many ways to stay informed as possible. Purchase a weather radio to ensure that you and your family stay weather aware. Travis Meyer understands the consequences that wind, drought, rain, heat and hail bring to rural families. He's lived it. At the first hint of storms, a young Alan Crone would start watching from the big front porch of his parents' home in McAlester. Michael Grogan is no stranger to Oklahoma weather. In fact, from a very young age, it's what inspired him to become a meteorologist. Growing up next door to Green Country in southeast Kansas, Stacia Knight quickly became familiar with the always-changing Oklahoma weather. Most meteorologists you meet will tell you that they have been fascinated with weather since a young age. Stephen is no exception! The News On 6 Storm Trackers provide an invaluable service to the public; they are the eyes and ears in the field. When there is breaking news across the state Osage SkyNews 6 can be first on the scene. Chief Meteorologist Travis Meyer brings weather safety to Oklahoma school kids! Travis Meyer’s Weather 101 is a fun and interactive way to teach weather and weather safety to school children, K-12th grades. When tornadoes strike, proper shelter can make the difference between life and death. Because of this, many organizations make it their goal to protect those who find themselves in the path of severe weather. FEMA offers an abundance of information for those interested in constructing safe rooms for individuals, families, or communities. The best shelter from a tornado is a safe room, basement or storm cellar. If those are not available, go to an interior room without windows on the lowest level of the structure, preferably a closet or bathroom. Place as many walls between you and the outside as possible. Cover yourself with pillows, a mattress or blankets and wear a helmet and shatter resistant goggles. Keep your shoes on. 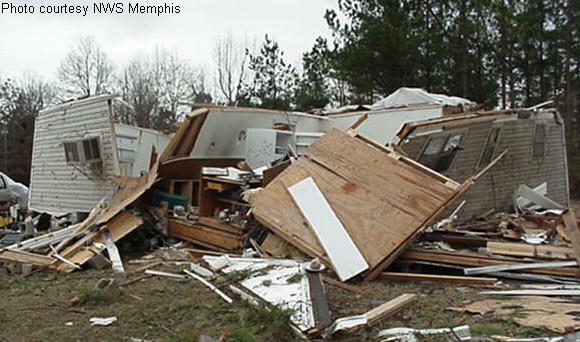 Mobile homes are extremely unsafe during a tornado. If you feel your home is unsafe, move to a preselected shelter before the storm arrives. Avoid windows and do not take shelter in halls that open to the outside. If you are in a vehicle, get out immediately and go to the lowest floor of a sturdy, nearby building or a storm shelter. If there is not a building nearby, lie flat in a ditch or depression and cover your head with your hands. DO NOT take shelter under an underpass or bridge. It is not safe since it can leave you exposed to flying debris. Be aware of the counties, cities and towns that are near you. It will be easier to track the tornado's direction if you are familiar with the geography of your area. Oklahoma weather can change in a heartbeat. Use this checklist to build a safety kit to help keep your family safe in the event of an emergency. When preparing for a tornado, or any natural disaster, you should have your disaster supply kit accessible. During a thunderstorm Mother Nature can put on a spectacular, and at times, dangerous show. Dangers associated with thunderstorms can include lightning, heavy rain, flooding, hail and strong winds. The life span of thunderstorms is usually less than an hour. When storms combine they can form squall lines. Some thunderstorms grow into powerful supercells which can last for hours and spawn tornadoes. Only 10% of the estimated 100,000 thunderstorms a year become severe, but that 10% accounts for most of the loss of life and property damage. The first step in staying safe in a thunderstorm is staying tuned into News On 6 Chief Meteorologist, Travis Meyer and the News On 6 weather team. If severe weather is possible in the area Travis and his staff of meteorologists will keep you up to date on all the watches and warnings and will let you know when and where the storms will strike. The life span of thunderstorms are usually less than a half an hour, but when storms combine they can form squall lines, which can grow into powerful supercells which can last for hours and spawn tornadoes. Avoid taking a shower or bath. If lightning strikes your house it may send a current of electricity across metal plumbing into your bathroom. Plastic piping will not carry lightning. If your visibility is impaired and you cannot drive through the storm pull off to the shoulder of the road, away from tall objects, such as trees, which could fall due to wind or lightning. If you cannot find shelter, stay away from tall, isolated objects such as trees, poles, or posts. If you begin to feel your hair stand on end, this indicates lightning is about to strike. Stay low. Curl up on the ground in a small little ball possible. Do not lie flat on the ground, it makes you a larger target for lightning, and try to keep out of puddles or other standing water. Never touch downed power lines. Dial 911 or the local power company immediately to ensure that the line is turned off so repairs can be made. A single stroke of lightning has 125,000,000 volts of electricity. Find out the safest places to go and what places to avoid. Lightning is approximately 54,000 degrees, that’s six times hotter than the surface of the sun! Lightning does and will strike the same exact place more than once. Hail is one of the most damaging events that can occur during severe weather. Hail is a weather phenomenon that can damage homes, vehicles and crops. It could even lead to death. On May 16, 2010, a devastating hail storm hit the Oklahoma City area causing approximately a billion dollars in damage. Fatalities from hail are rare in the U.S., the last recorded was a Colorado infant in 1979. Deaths from hail are more common in underdeveloped parts of the world where people live in poorly constructed buildings. Hail is fairly common in Oklahoma in the spring and being prepared on what to do during a storm can help protect you and your property. If hail begins to fall, take cover. If you are driving, stop if possible because the momentum of the vehicle can make the damage worse. Remember, protect yourself first before trying to save your car from those pesky dents. Hail hurtles to the ground at speeds up to 90 miles per hour. Hail is spherical or irregular shaped chunks of ice produced by intense thunderstorms. It is considered to have a diameter of at least pea sized and can become very large. Hail forms when strong currents of rising air, called updrafts, carry water droplets high enough in a thunderstorm for the water to freeze. More and more water freezes around the piece of ice, causing it to grow in size. Once the frozen pellet is too heavy for the updrafts to keep it within the cloud, it begins to fall. For the hail to grow, strong updrafts catch the falling hail and carry it upward again, adding new layers of ice. In the U.S., hailstorms are most common in the Central Plains, especially just east of the Rockies. Hail is usually produced by cumulonimbus clouds, called thunderstorms. Hail forms from condensation nuclei like dust or ice crystals. Then supercooled water freezes on contact with the ice around the nuclei causing it to grow larger. Cut in half, a hailstone has concentric rings like an onion, which reveals the number of times it traveled to the top of the storm before falling to Earth. The largest hailstone ever reported was 18.75? around, 7? wide and weighed 2 pounds. The hailstone fell on July 23, 2010, in Vivian, Nebraska. When hail falls to Earth, the larger ones can reach speeds over 100 mph right before impact. Hail tends to occur in warm weather because hot air rising from the ground creates the turbulent updrafts and tall clouds necessary to keep the ice particles aloft for a long enough time to form hail. Grauple:Soft, opaque hail with a snowflake–like structure that bounces off of hard surfaces, also referred to as snow pellets. Small hail:Has a higher density than grauple, and is usually semi–transparent and rounded, typically up to a 1/5? in diameter. Hailstones:Round stones of ice, with layers that look like an onion. The layers are formed while the hail is rising and falling in the updrafts. A flood is a natural disaster that occurs when there is more water than a lake, river, creek or even the ground can handle. A flash flood is sudden flooding that occurs when floodwaters rise rapidly with no warning within several hours of an intense rain. Flash floods usually happen after heavy rainfall from a slow moving thunderstorm. Flash floods are the #1 weather–related killer in the U.S.; nearly half of those deaths are auto related. Unlike tornado season, flooding can happen any time of year. Keeping you and your family safe from a flood begins with information. Tune into News On 6 for the latest watches and warnings from Chief Meteorologist Travis Meyer and the News On 6 weather team. In the event of flash flooding, they’ll be on the air letting you know what you should do and where you should go to seek higher ground. Water is one of the most useful resources on Earth. We drink it, bathe in it, and cook with it, but in large enough quantities, water can overturn cars, destroy homes and even kill. Never drive or walk through flood waters. If you cannot see the roadway, take a different route. Move to higher ground immediately if water begins to rise. Never go past an area that is roped off or blocked by police. It’s blocked for a reason. When a flash flood warning is issued, or if you think it has already started, evacuate immediately. You may have only seconds to escape, so act quickly and move to higher ground. If you experience flooding and need help, call your local authorities immediately. Floods can take a few minutes to a few hours to develop, and if you live in a flood prone area, you should take the following steps to protect yourself. Prepare a family disaster plan. Identify where you could go if told to evacuate. Choose several places, such as a friend’s home in another town, a motel, or a shelter. Keep insurance policies, documents and other valuables in a safe–deposit box. When a flood warning is issued, tune into NEWS on 6 for the latest information and advice. Flash floods are the #1 weather-related killer in the U.S.; nearly half of those deaths are auto related. Has the car you’re looking at has been damaged by flood waters? Too often, experts say, people try to drive through water moving across roads. To reduce your potential flood damage, you should raise your furnace, water heater and electric panel. 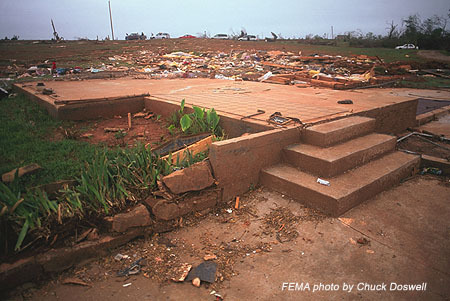 Fujita Scale, or F–Scale, levels are based on the damage caused by tornado wind speed. Dr. T. Theodore Fujita developed the scale in the early 1970s. Experts caution that the F–Scale is not a completely reliable measure, due to difficulties in precisely judging wind speeds. Rating: 0 F-Scale: < 73 EF-Scale: 65 - 85 Typical Damage: Light Damage - Some damage to chimneys; branches broken off trees; shallow - rooted trees pushed over; sign boards damaged. Rating: 1 F-Scale: 73 - 112 EF-Scale: 86 - 110 Typical Damage: Moderate Damage - Peels surface off roofs; mobile homes pushed off foundations or overturned; moving autos blown off roads. Rating: 2 F-Scale: 113 - 157 EF-Scale: 111 - 135 Typical Damage: Considerable damage - Roofs torn off frame houses; mobile homes demolished; boxcars overturned; large trees snapped or uprooted; light - object missiles generated; cars lifted off ground. Rating: 3 F-Scale: 158 - 206 EF-Scale: 136 - 165 Typical Damage: Severe Damage - Roofs and some walls torn off well - constructed houses; trains overturned; most trees in forest uprooted; heavy cars lifted off the ground and thrown. Rating: 4 F-Scale: 207 - 260 EF-Scale: 166 - 200 Typical Damage: Devastating Damage - Well constructed houses leveled; structures with weak foundations blown away some distance; cars thrown and large missiles generated. Rating: 5 F-Scale: 261 - 318 EF-Scale: > 200 Typical Damage: Incredible Damage - Strong frame houses leveled off foundations and swept away; automobile - sized missiles fly through the air in excess of 100 meters (109 yds); trees debarked; incredible phenomena will occur. * IMPORTANT NOTE ABOUT F–SCALE WINDS:Do not use F–scale winds literally. These precise wind speed numbers are actually guesses and have never been scientifically verified. 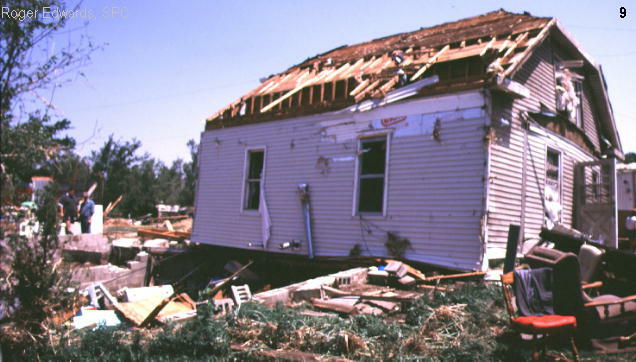 Different wind speeds may cause similar–looking damage from place to place — even from building to building. Without a thorough engineering analysis of tornado damage in any event, the actual wind speeds needed to cause that damage are unknown. The Enhanced F–scale was implemented February 2007. A statement issued by the National Weather Service when a weather event is expected to be an inconvenience to residents in the area, but does not meet warning criteria. During the spring months, watch for Significant Weather Advisories for strong storms that are just below severe thunderstorm limits. A term used to describe a wind shift in a counterclockwise direction. Just ahead of a dryline, backing winds cause more convergence and increase the chance for developing thunderstorms. A storm with dry, driving snow, strong winds and intense cold. A line of thunderstorms that resemble a bow–shaped line on radar imagery. Bow echoes are often associated with damaging straight–line winds, and can sometimes produce weak tornadoes. Abbreviation for “Convective Available Potential Energy”. A measure of the energy in the surrounding atmosphere available to cause convection. Higher values correspond to higher risks for severe weather. Funnel clouds that develop from a small shower or thunderstorm when the air aloft is unusually cold. These funnels may touch down briefly, but are usually very short–lived and aren’t associated with violent tornadoes. Small particles on which water vapors attach to initiate condensation. Dust particulates, sea salt, sulfur and nitrogen oxide aerosols serve as common condensation nuclei. When winds at the surface run perpendicular or opposite each other, usually seen on either side of a moving dryline. When these winds collide at the surface, there is no way to go but up, which results in accelerated rising air and developing thunderstorms. A type of cloud, also called a “thunderhead”. These clouds often resemble a blacksmith’s anvil as the top of the cloud generally extends in a smooth plane outward from the center of the storm across the sky. These clouds are usually associated with lightning and strong winds. Weather radar uses “The Doppler Effect” to measure the velocity of particles in the air, such as raindrops or hailstones. The Doppler Effect was named for Christian Doppler, an Austrian physicist who described the condition that causes a train whistle to sound differently depending on whether the train is traveling toward or away from an observer. A powerful downward current of air, usually accompanied by precipitation within a thunderstorm. A frontal boundary between warm, moist air and warm, dry air. Drylines usually form near the Texas panhandle and move eastward through the day, causing severe thunderstorms in Oklahoma during the spring months. A rapidly rotating column of air that is made visible by the dust and debris that it picks up. Dust devils usually occur on hot and dry afternoons, when the ground warms very quickly. Formerly known as the F–Scale, it is a scale used to measure the strength of a tornado based on the damage it causes. The F–Scale, or “Fujita Scale” was introduced in 1971, created by Ted Fujita of the University of Chicago. The “EF–Scale” or “Enhanced Fujita Scale” was developed recently due to research that suggested wind speeds in the original scale were underestimated. The EF–Scale was put into operation early 2007. Particles with a negative charge. The calm, circular center of a tornadic storm. The eye of a tornado may be only a few feet or yards across. Flash flooding is actually occurring in the warning area. A warning can also be issued as a result of torrential rains, a dam failure or snow thaw. Flash flooding is possible in or close to the watch area. Flash Flood Watches can be put into effect for as long as 12 hours, while heavy rains move into and across the area. Means an overflow of water from a river is possible for your area. Means flooding conditions are actually occurring in the warning area. Rain that falls as a liquid but freezes into glaze upon contact with the ground. A cloud, shaped like a funnel, that extends from the bottom of the cloud base. A rotating funnel cloud, associated with a wall cloud in a strong to severe storm, can develop into a tornado. A funnel cloud does not touch the ground. Once it makes contact with the ground, it is then considered a tornado. A slang term used to describe a small, short–lived tornado that occurs along the gust front, or leading edge of a line of thunderstorms. Gustnadoes do not usually cause much damage. Precipitation in the form of small pellets of ice, larger than 5mm. Hail forms when water freezes at high altitudes within a thunderstorm and then falls to the ground. Strong thunderstorms, with powerful updrafts can produce larger pieces of hail when frozen water droplets stay within the cloud for longer periods of time and collect more ice, growing larger, until they are too heavy for the updraft to support and they fall to the ground. A signature on radar, associated with a tornadic rotation that appears as a hook–like extension from a strong thunderstorm. Not all observed hook echoes accompany tornadoes, or vice–versa, but seeing a hook echo on radar is a good indication that a tornado may have formed, or may form quickly. The inward flow of air moving toward a thunderstorm. Usually the air moving through the updraft is warm and moist air. The tendency for air parcels in an environment to rise very rapidly and possibly develop into thunderstorms. The greater the instability, the greater the chance for severe weather. Very strong winds concentrated in a narrow stream in the upper atmosphere. Jet streams are the driving motion for weather systems across the continent. In the U.S., jet streams move from west to east. 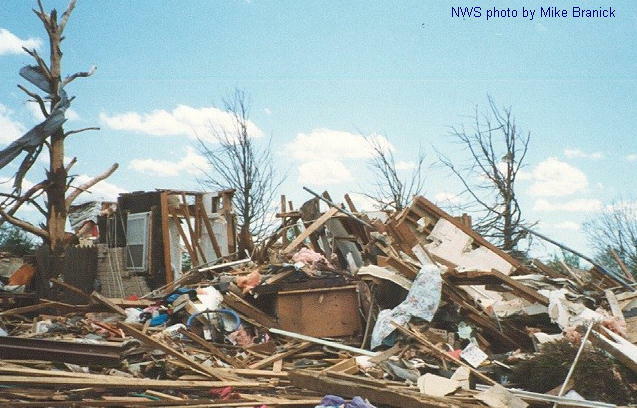 A whilrwind, similar in appearance to a tornado, but that does not occur from organized storm–level rotation. Landspouts are usually very short–lived, do not cause much damage and are seen as merely a dust whirl. A channel of charged air created by excess electrons in a thunderstorm cloud. A leader reaches from the cloud to the ground below, looking for positive charges. A sudden discharge of electricity produced when opposite electrical charges build up between clouds, between a cloud and the ground, or within one cloud. When the charges meet, a bright band of light occurs, accompanied by thunder, which is the sound of the super–heated, and quickly expanding air. An area of relatively strong winds at the surface. Also abbreviated as LLJ, it usually refers to strong southerly winds that increase overnight, drawing in moisture from the Gulf of Mexico. Abbreviation for Mesoscale Convective Complex/Mesoscale Convective System. These terms are usually used to define a large cluster of thunderstorms that persist for several hours. Sometimes this refers to a system that started as a line of thunderstorms and converged as the system weakened, especially in the evening, as it loses the heat from the sun. The main threats from these systems include high winds, heavy rainfall, and flooding. A cyclonic vortex of air, between approximately 2—10 km diameter within a convective storm. An area, usually defined as less than 2 miles across, in which a concentrated downburst of sinking air can cause significant wind damage. Microbursts are usually short–lived and occur as a thunderstorm is decaying, and all of the air that had been lifted within the thunderstorm comes crashing to the surface. A tornado during which, more than one condensation funnel is present at the same time, and are rotating around the same common center. 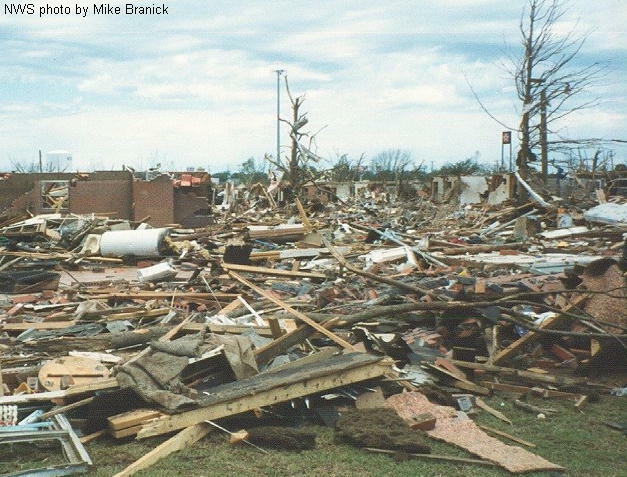 Multi–vortex tornadoes can be among the most violent. Abbreviation for the National Weather Service. The NWS is a government agency that is the primary source of weather data for the United States. 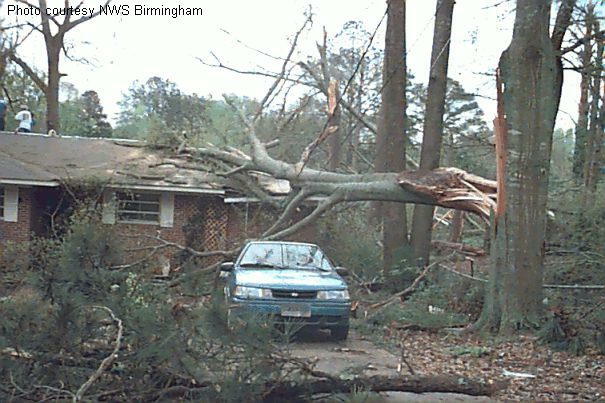 The NWS is responsible for issuing warnings during life–threatening weather situations. There are two NWS offices in Oklahoma; one located in Norman, the other right here in Tulsa. The outward flow of air moving away from a thunderstorm. Usually air that is falling from a storm’s downdraft and is usually cool and dry air. The highest instantaneous wind speed observed, usually within a thunderstorm. Particles with a positive charge. An electrical charge that travels from the ground to a thundercloud. This return stroke releases tremendous energy, bright light and thunder. Abbreviation for Rear Flank Downdraft. An area of dry, sinking air on the back side of a thunderstorm. Usually associated with a clear area and cool winds that can be strong at times. A low, horizontal, tube–shaped cloud along the leading edge of a thunderstorm. Roll clouds are completely detached from the base of the thundertorm, unlike shelf clouds that are a part of the thunderstorm base. A narrow funnel, or tornado that resembles a rope and is usually seen in the decaying states of a tornado. Refers to a single funnel within a multi–vortex tornado. Many times, a satellite tornado will be in the form of a smaller, rope–like tornado, rotating around a much larger, more violent tornado. A slang term referring to small, and ragged clouds that hang low along the horizon below the main cloud deck. These clouds are indicative of abundant surface moisture and upward motion close to the surface. A thunderstorm with winds of 58 mph or greater, and/or 3/4? or larger hail. Heavy rainfall and frequent lightning are also threats from severe thunderstorms, and these storms have been known to produce tornadoes with little or no advanced warning. A severe thunderstorm is taking place in your area. A severe thunderstorm is likely to develop in your area. The change in wind speed or direction within a given area, either horizontally or vertically. A low, horizontal, tube–shaped cloud along the leading edge of a thunderstorm, or sometimes along the leading edge of a cold front, even in the absence of thunderstorms. Unlike roll clouds, a shelf cloud is attached to the base of the thunderstorm, or the cloud deck associated with a cold front. Precipitation in the form of ice pellets created by the freezing of rain as it falls. A light, brief shower of snow. Abbreviation for the Storm Prediction Center. A government agency that works closely with the National Weather Service Offices to monitor and forecast severe weather. The SPC is responsible for issuing all weather hazard watches across the U.S.
A sudden, violent gust of wind, often accompanied by rain, snow, or sleet. A line of thunderstorms, moving as one unit. Squall lines can move along a quickly advancing cold front or dryline. The main threats from a squall line are heavy rain, strong winds, hail. Tornadoes are also possible associated with bow echoes. A form of electricity created when an object has too many electrons, giving it a negative charge. A dangerous convective thunderstorm with a persistant rotating updraft. Supercells are responsible for the majority of violent severe weather events, and are the most likely storms to produce tornadoes. To cool (a liquid) below a transition temperature without the transition occurring, especially to cool below the freezing point without solidification. The sound that follows a flash of lightning and is caused by sudden expansion of the air in the path of the electrical discharge. A violently rotating column of air that is in contact with the ground. Sometimes a condensation funnel is not obvious for the entire length, cloud to ground, but even so, a debris cloud will be visible on the ground. A geographic area in Mid–America that stretches from Texas to Nebraska and east into Iowa where tornadoes are most common. Tornadoes can form anywhere in the United States, but occur in greater numbers within Tornado Alley. Indicates that conditions are right within a certain area for tornadoes to form within developing thunderstorms. A tornado watch is issued for a large area that will include numerous counties. Indicates that a tornado has been detected, either by Doppler radar or by a storm chaser out in the field. A tornado warning is issued for a small area that will include one–two counties. When a tornado warning is issued, residents within the warned area should take cover immediately. The intersection point between boundaries, such as a dryline and a cold front. Often used to describe the area of low pressure where a cold front, dryline, and warm front meet. This area can often be the focus for severe thunderstorm development. A powerful upward current of air. Updrafts are composed of warm, moist air that feeds a thunderstorm. As it rises, the moisture condenses to form a cumulus cloud and this is often the first visual sign of a thunderstorm. A term used to describe a wind shift in a clockwise direction. As opposed to backing winds, veering winds cause divergence at the surface, and often aid in inhibiting severe weather. As seen in the sky, streaks or wisps of precipitation, either liquid or frozen, falling from a cloud, but evaporating before reaching the ground. Often virga can be detected on radar as very light rain, even though it is not reaching the ground. Is a spinning, often turnulent flow (or any spiral motion) with closed streamlines. A localized, and often abrupt lowering from the cloud base. Wall clouds form in the lower portion of a strong updraft, usually associated with a supercell. Wall clouds are normally found on the south or southwest wide of a thunderstorm, normally within the inflow region. Wall clouds that exhibit persistent, sustained rotation can often precede tornado formation. In the most general form, a non–supercell tornado over water. Waterspouts form in a different manner than tornadoes, and are not associated with a wall cloud, or a rotating thunderstorm. Waterspouts are often much weaker than a supercell tornado and are near the water equivalent of a landspout. Waterspouts are most prevalent during the summer months and more waterspouts are reported in the Florida Keys than any other place in the world. A tornado that appears wider than it is tall, and has a wedge–like appearance. A tornado’s destruction can not be defined by its size, but some of the most violent tornadoes have been reported as a wedge. safe room provides a shield of protection for you and your family. A safe room is a hardened structure specifically designed to meet the Federal Emergency Management Agency (FEMA) criteria and provide ”near–absolute protection” in extreme weather events, including tornadoes and hurricanes. Near–absolute protection means that, based on our current knowledge of tornadoes and hurricanes, the occupants of a safe room built in accordance with FEMA guidance will have a very high probability of being protected from injury or death. Underground storm shelters, made from reinforced steel or concrete, are prebuilt structures that are installed underground in a yard or underneath a garage. Prebuilt shelters come in a range of styles:welded steel box, steel skeleton with steel panels, or a prefabricated unit that is then bolted together. They should also be anchored to a home's foundation. This is a structure that is placed inside a home while it's under construction. The structure is often made using reinforced concrete or wood and steel—and can double as a closet or storage room. What is a FEMA Safe Room? To be considered a FEMA safe room, the structure must be designed and constructed to the guidelines specified in FEMA P–320, Taking Shelter from the Storm:Building a Safe Room for Your Home or Small Business (FEMA, third edition, 2008a) (for home and small business safe rooms) and FEMA P–361, Design and Construction Guidance for Community Safe Rooms (FEMA, second edition, 2008b). When severe weather strikes, you’ll want to track storm locations and notifications. Weather watches and warnings are often related to county areas, so use this map to familiarize yourself with Oklahoma county locations. Move your mouse across the map to highlight the various counties and their names. Download Trav's Storm Map to track storms as they move into your area. What does a Tornado Siren mean? The siren is your cue to turn on your television, radio or all–hazards alert weather radio to get information about the storm’s location and proper protective actions. Citizens are encouraged to monitor weather conditions until the threat has passed. Cities and counties have a “local option” allowing them to activate their sirens for hazardous conditions that pose a significant threat to life. The sirens are reactivated each time the National Weather Service issues a new tornado warning, so the may sound more than once. No “all clear” signal is given when the threat has passed.